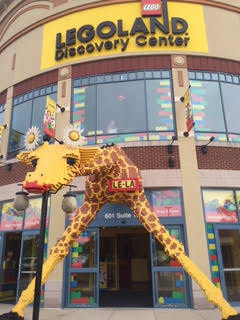 We love Legoland Discovery Center in Schaumburg, IL. There are some who feel it is too crowded and expensive. 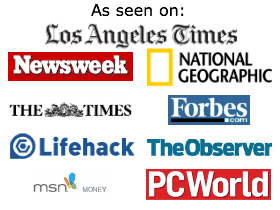 If you follow these tips, you will have a great experience and want to return again. Here’s what to do at Legoland Chicago to enjoy the best possible experience. Planning your visit to Legoland Chicago: Before you go, make sure to…. If you pay full price and it’s crowded, you may be disappointed. Look online on the Legoland website for the base price so you know the maximum you will need to spend. Costco in Schaumburg, IL: If you live locally, you can check the local Costco to see if they have Legoland admission tickets. Local library: Many Chicagoland libraries also offer passes that local residents can “check out” with their library card. Annual Pass at Legoland Chicago: If you will be able to go at least twice during the next year, it may be worth it to get an annual membership. Legoland’s membership price varies throughout the year. Check online before you go. Go Chicago Card is not a good deal for Legoland Discovery Center. The single day price for a Go Chicago Card is much more expensive than the most expensive admission fee to Legoland. Also, you will be rushed to do two Go Chicago attractions on the same day if one of them is Legoland Discovery Center. It will take 35 – 45 minutes (on a good day) to travel from Chicago to Schaumburg. Plan to spend the day at Legoland without rushingvto additional paid Chicago attractions the same day. 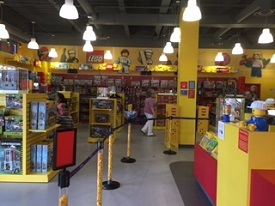 Lego Club magazine: If you are going to Legoland California, Legoland Florida or another Legoland (not one of the Legoland Discovery Centers) you may find a “Pay for an adult and the child is free” coupon. You should subscribe to this awesome free magazine for kids. There are two different versions, depending on your child’s age. Now that both my kids are in the older age bracket, we just subscribe to one Lego Club magazine in order to reduce the environmental impact and to minimize clutter. While the Chicago Legoland staff probably won’t have as many choices as they will at Legoland California, it is still worth bringing some Lego mini figures to trade. 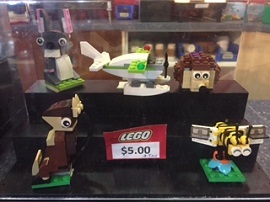 In order to trade mini figs at Legoland Chicago, your child needs to bring a mini figure that includes a Lego head, body and legs. If you have an accessory to go with it, that’s great; however, it’s not a requirement. Look for the Lego employees with mini figures on their name tags. It’s a nice experience for your children because the employees will accept the trade. 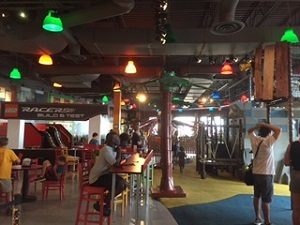 During the school year, Legoland Discovery Center in Chicago usually opens at noon. On school days off and during winter break, spring break, and other times, they open at 10 am. They are open at 9 am on Saturday and Sundays during the summer and 10 am other times during the year. Bottom line: Check their website for their hours before you go. When are the least crowded times at Legoland Chicago? Go during the school day when schools are in session: If there is any way of going during a school day, those days are often the least crowded. When my kids were preschoolers, we went to Legoland Chicago a lot because it was empty during the school year. Go after school: If you can’t go during the school day because your child has school, go after school and stay until 7 pm when it closes. Go after 2 pm: If you are visiting during the summer, a day off from school, or on Saturday or Sunday, the best time to arrive is in the afternoon. Stay until 7 pm, and you’ll have plenty of time. A great time to come is if your child has a fall break or a different spring break than when the local schools are off; it will be less crowded. Summer day camps often have their field trips on Friday so avoid those in the summer if you can. They will usually leave by the early afternoon; however, so plan to come at 2 pm and stay until closing at 7 pm. When you exit the Legoland Chicago attraction, you have to exit through the Lego store. Talk with your child in advance of your visit. After an exciting day at Legoland Chicago, he or she will want a lot of things from the store. Make a plan in advance so you end your Lego experience on a positive note. Will this be your child’s souvenir from their vacation? Will you agree to pay for half if your child pays for half? Can they pick something as a reward for grades, chores, as a gift, or just because? You will not probably not find a major attraction anywhere in Chicagoland that charge only 25 cents (!) for a locker. Bring a few quarters if you want to access the locker multiple times during your visit. They do have a change machine right next to the lockers in case you forget. Bring some pennies too and buy a flat penny souvenir for your child for just 51 cents. You are not allowed to leave and re-enter, so plan to eat before you arrive. There are some restaurants in the Streets of Woodfield Plaza. 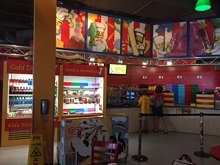 Legoland Discovery Center has a snack bar with sandwiches, chips, ice cream novelties, etc. 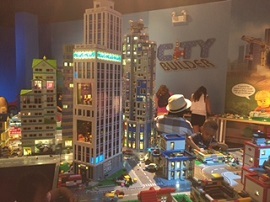 Legoland Discovery Center Chicago has a Lego build class that you have to reserve your time. As soon as you make your way to the second floor, go and reserve times for everyone in your group who wants to build so that you don’t miss out. It’s usually kids who build but adults are welcome to build or to assist/just sit there. The Lego staff will give you a ticket that you bring back at that time. You are there for your child. Try your hardest to have patience and to not rush him/her to see everything. 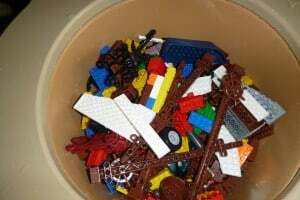 It may seem like a waste of your time and money that your child wants to go up and down the slide or sit with a pile of Lego bricks and build because you can do that at home. Do your best to relax and enjoy what your child is enjoying. 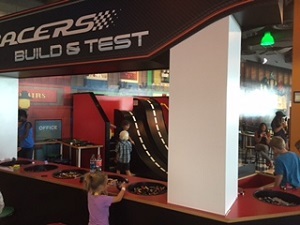 You may want to discuss in advance what your child really wants to do but know that Legoland Discovery Center isn’t that large so if you will be there for at least three hours when it’s not crowded, you will be able to thoroughly enjoy everything. My family stays at least five hours, and we’ve been there over 15 times in six years. Especially now that my kids are older, they spend time doing exactly what they want to do. There are usually about four Lego movies that rotate throughout the week. On our last visit we were able to see the new Lego Movie 4D – A New Adventure and Lego Nexo Knights – The Book of Creativity. Each movie is approximately 10 – 12 minutes. There is a sign which will countdown the time until the next Lego movie. This is great so that you know how long you have before waiting outside the theater. On our most recent visit, we sat through three different movies (one we saw on our last visit) as someone asked the friendly Lego staff member to play a certain one that wasn’t in the rotation. The theater was fairly empty which was great because we all enjoyed being able to sit in our seats without having to get back in line. The theater is fun. It’s 4-D which means there are some surprises like some snow or rain and wind, depending on the movie. When you enter the Legoland theater, the staff member will give you a pair of 3D glasses. The Lego tour is especially fun when it’s not crowded so your child will have a chance to push the button to make the machine run. We’ve been on the “tour” when it was crowded and when it wasn’t. You will enjoy it either way, and the Lego staff usually invites the children to the front. Everyone in attendance, even the adults, will receive a free Lego brick that is compatible with Lego bricks as well as Duplo bricks. Sometimes they give out a themed brick, such as when we went for Brick-or-Treat and over the winter holiday. Plan to take a few minutes to complete the survey at the kiosk when you leave the Legoland Discovery Center. 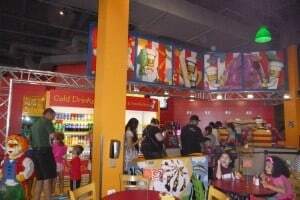 There really aren’t that many places that ask for their customers’ feedback, so be sure to take advantage of this opportunity to recognize great service from a Legoland Discovery Center employee or to leave constructive criticism. It’s always great to see what will be new at Legoland Discovery Center. They work hard to improve their guests’ experience and are often adding to, changing or modifying their exhibits. 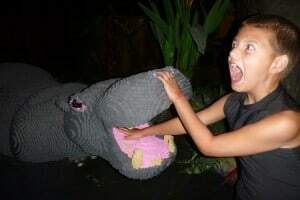 You know what to do at Legoland Chicago, now here’s what not to do. The crowds will thin out so don’t wait in a line longer than 10 minutes for Merlin’s Apprentice Ride or Kingdom Quest Laser Ride. There will be a time during your visit when you should be able to not have to wait in line at all for a ride and ride it again and again. This is also important for other crowded attractions, including the Pirate Adventure Island playset and the Legoland Racers Build and Test section. Again I repeat, Legoland will be crowded on the weekend as are most Chicagoland area attractions. If you do go on the weekend, your best bet is to come mid-afternoon (1:30 pm/2 pm) or later and stay until closing (7pm). Or come for the majority of the day, and watch a Lego movie. Reserve your spot for the Lego Master Builder Academy early, when it is crowded. 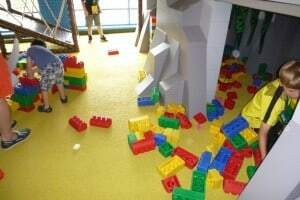 Then, when it’s less crowded, you can enjoy the rides, the Legoland Pirate Adventure Island exhibit (playland and interactive Lego section) and Build and Test section. The restrooms are fun, colorful and clean the Legoland restrooms. There is even a family bathroom which is very convenient. Come with a smile and your camera as your child enjoys a very hands-on experience playing with Lego bricks in new ways. 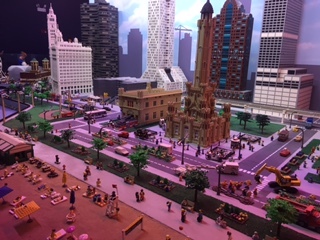 If you plan what to do at Legoland Chicago in advance, you will be sure to have a great visit. If you are planning a midwestern road trip, be sure to see everything Nebraska,Iowa and Milwaukee have to offer. We had another chance to visit one of my kids’ favorite places! What I love about Legoland Chicago Discovery Center is that they are always working to improve and enhance their customers’ experience. We experienced another positive change on our last visit. On their second floor, they transformed the huge play structure. Their Construction Zone themed playset is no longer. What awaits Lego fans? Legoland Chicago Pirate Adventure Island…. It’s a must-see exhibit! Located on the second floor in the “big room,” my kids eagerly went up to the large pirate ship. There is so much to do in this updated section as well as on this entire floor. There is a huge pirate ship for the kids to climb on, in, through, under, and around. There are rope nets to climb, and planks to walk. All of the kids participating in this exhibit were having fun building, climbing, and playing. They can look out the telescope, fire a cannon, and have fun climbing and crawling through the ship. Kids can play “pirate” or whatever they like. Additionally, on the ground, under and surrounding the ship, there were also a lot of kids enjoying themselves. They were building with the large Lego rubber bricks and also playing on and with the ship itself. Another positive about the Legoland Chicago pirate ship area is that kids now keep their shoes on. When my kids first went up to it they immediately started to remove their shoes as they have done for years. But now, kids now keep their shoes on… a very positive change! It is more sanitary and just cleaner-feeling all around. Now they don’t have to constantly put their shoes back on when they want to go to another exhibit. In all the years we have been coming to Legoland Chicago, there hasn’t ever been a water table… until now. If you’ve ever been to the children’s museums in the area, you will have seen them before. This one is unique in that it slopes downward so that your boat can race against another boat or simply sail the course on its own. What is different about this water table from other water tables we’ve experienced is that this one isn’t so much about playing in the water as it is about creating and sailing a boat with the available Lego pieces. That’s great because your kids won’t get as wet! There are aprons available on the nearby hooks if you want your child to protect his/her shirt. Their arms will still get wet so be sure to roll up their sleeves. Kids and adults will have a lot of fun constructing a Lego boat. There were lots of boat “base” pieces, large and small, to choose from, even when several kids were surrounding the water table building. There were also many unique and interesting sea pieces as well, including octopus, anchors, masts and many more. You can build your boat right by the water with the tubs of available Lego pieces. 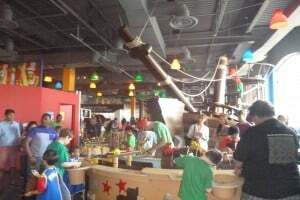 My kids enjoyed playing in these two sections which make up the new Legoland Chicago Pirate Adventure Island. What I noticed was how well the entire pirate area was able to accommodate so many children on a busy Saturday. It was crowded but what struck me was that many age ranges enjoyed themselves safely with this exhibit. Also, more than I noticed for the previous Construction Site play structure, there were a lot more children aged 5 and under enjoying it, though it is fun for older kids as well. On the day we were there it was also nice to see how many parents were being positively engaged with their kids, playing along side them, and not on their phones. Others were standing just outside the exhibit actively supervising their children, which was also nice. Also on the second floor in the big room is my boys’ favorite exhibit, the Build & Test section. When Legoland Chicago added the pirate exhibit, they changed some other things around, including this section. Although this area has a much smaller footprint now, it was still fun. 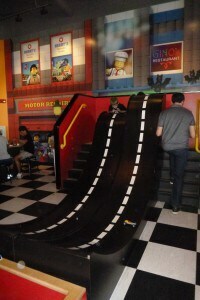 They removed an entire ramp with slots for four racers and left the two ramps that adjoin together, allowing two racers to race simultaneously. This space has been modified many times, but luckily, they have never removed it from Legoland Chicago Discovery Center. This section involves constructing vehicles out of Lego bricks and wheels and racing them down one of two ramps. There are a few steps to go up to the top of the ramp to launch your vehicle. However, even when there is a little bit of a line, the cars just take seconds to go down the ramp, and usually the person who raced the car rushes back down the steps to reclaim his/her (hopefully intact) car. So the entire process is fast and the line moves along. The only thing that could be better was if somehow they had stairs going up to launch the car and then a set of stairs in the back to come down so that the person rushing down isn’t bumping into the people coming up. But all in all, Legoland Chicago has made this exhibit work with the smaller amount of space they have available. My kids sat for a long time creating cars, racing them, modifying them, and racing them again and again. Like at the pirate area’s water table, the tubs of Lego bricks and pieces are available right in the tables, and young and old alike can create vehicles sturdy enough to make it down the ramp. There are stools to sit on as well. I usually do not visit here or any major Chicago attraction on a weekend, but we were on a short vacation in the area and that was the only day we could make it. We really wanted to see the new Legoland Chicago pirate exhibit. It was crowded when we visited, but not as crowded as I expected. We were there from 12 pm – 3:45 pm on a Saturday. I brought my 8 and 9 year old sons and my 13 year old niece. As it is everywhere we go, my kids enjoyed seeing how many steps they walked on their Fitbit Zip. After visiting the Lego jungle animals we were in a large room with full-sized figures of many popular characters, including Batman, Harry Potter, R2D2, and several more. It would be wonderful if they would put the Lego Racers: Build & Test section, such an interactive area, in this large room instead of downsizing it on the second floor. They could populate the rest of the center with these characters instead of having them in such a large space. After exiting the characters’ room, one comes upon the Kingdom Quest Lego Ride as well as the lockers, stairs and elevator to the second floor. The Kingdom Quest ride is always fun, and is meant to accommodate up to four people, though you can have one or two more. There are laser guns attached to just four of the seats, however. When we were there it was a little disappointing that after waiting in line for about 10 minutes, one of the laser guns in our coaster didn’t work. Also upsetting that once on the coaster enjoying the ride, there were several of the laser fields that weren’t registering when we shot them. I told a worker who seemed to already know about it. I left a review — outside the gift shop upon exiting Legoland Chicago — on the kiosk mentioning this. Another disappointment overall with this ride is that when they converted it to be a laser shooting game (in the past, it was just a ride through the kingdom) they didn’t put in more targets to shoot and get points for. As it stands, there are entire sections that you aren’t able to shoot at anything to register points. Overall, the ride is fun and engaging. 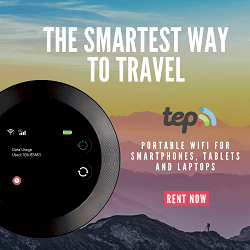 It is fun for kids and adults to see how many points they have — it keeps an electronic total for each of the four seats — and could be made better with some additional targets. After riding the Kingdom Quest ride twice, we made our way upstairs and into the large room which consists of Pirate Adventure Island, Lego Racers: Build & Test, Merlin’s Apprentice Ride, Duplo Village, and the Cafe. Please see above for descriptions of Pirate Adventure Island and the Build and Test section. After an hour of playing in the two sections, we took a break and bought some snacks from the Cafe. There are tables that are reserved for customers who buy food from the Cafe. There is also a taller table area which seems to be open seating which is nice to get out of the way of the kids playing and still mostly be able to see your (older) kids. Then the kids played a bit more in each of the sections as well as went on the Merlin’s Apprentice Ride. I was very happy to see my 13 year old niece having fun on the ride and also enjoying herself throughout the day building a car and a boat. The Duplo section is their toddler section. It is off to the side of the water table, on the end and out of the way from heavy traffic areas. It has seating for caregivers and lots of room for little ones to play. There is also a little slide to go down. We left the large, main room and went to the 4D Cinema. The line for the movie was long but Legoland Chicago conveniently posts a countdown clock to show in how many minutes the next movie will start. My kids kept playing until there were two minutes to showtime, and then we got in line. So while there was a long line, it went quickly once the doors were open. 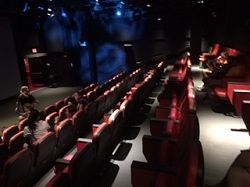 It is a large theater so everyone was able to get a seat. Kids think it is fun to wear the 4D glasses which a staff member gives you when you enter the theater. You return the glasses when you exit the theater. My kids and I, even having seen this movie several times, still enjoyed it and loved the special effects. My niece loved it too. We still wanted time to visit the gift shop so we unfortunately didn’t have time to go into the Factory Tour to see how bricks are made and to get our free brick. Nor did we have time to make the project in the Lego Master Builders Academy. We got our stuff out of our locker — it is just a quarter to use! Then we made our way to the Lego shop. Each child picked one thing they were very happy with — a minifigure, a Mixel, and an engraved keychain. Unfortunately, we don’t buy the season passes for Legoland Discovery anymore as we live several time zones away. But if you can afford to do it and know you will be back in the next 12 months, it is definitely worth it. Parking is always free so even if it is crowded, and you just stay for an hour or two, it is okay. Come when you can, and stay for as long as you can. You won’t feel compelled to get the full day, “do everything” experience. You won’t have to rush your child through each ride or exhibit. It is so great when you can let your kids take the lead and do as they wish, even if it means they hang out and play and enjoy just one or two sections during the visit. So much of their lives are structured and hurried. It is nice for them to just be and not be stressed about seeing everything if they are perfectly happy where they are. So try to get an annual pass or at least be sure to find a coupon or go on days they have better deals. Much like trading cards for kids, Lego building is timeless. 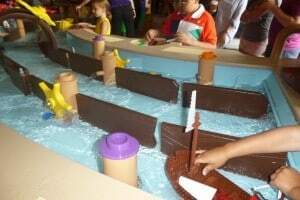 It’s so worth it to have your child experience the Pirate Adventure Island exhibit. There are so many fun things to do in the midwest, including seeing the sites and exploring Chicago, Milwaukee, Iowa and Nebraska. Enjoy fun road trips for kids for lasting memories. We were very happy to have been able to check out Legoland Chicago Pirate Adventure Island. It always makes me happy to see my kids engaged, inventive, creative, and having a great time. They loved the playing on the pirate ship and building ships to sail in water. They also had fun in the other areas as usual. We look forward to our next visit to Legoland Chicago and are eagerly awaiting to see what changes we notice. Have you checked out the new Pirate Adventure Island exhibit?